Within the competitive market of wooden packaging there are a few key differentiators that separate the standard business model from the unique and elite companies. One of these differences is the ability to design custom and complex pallets, crates or shipping boxes. A few years ago J.F. Rohrbaugh Co., Inc., and West Side Wood Products decided to step up our efforts to capitalize on this niche part of the industry. The goal was to gain market share while increasing our design abilities with current and potential customers. Pallet companies have a variety of pallet software programs such as the Pallet Design System™ (PDS) or Best Load™, to effectively design and analyze performance capabilities of standard pallets. In fact, we use PDS for most of our customer’s pallet needs since this program gives us the ability to create standard and custom pallets, integrate these designs into our ”ERP” system, and predict unit load layout with weight/storage capacities. Although PDS is a very capable and useful tool, it has limitations when designing crates and boxes. We feel there is a better solution for the crating and multifaceted pallet projects our customers bring to our sales team. For the last few years we’ve been using the 3D CAD program SOLIDWORKS® to design complex wooden packaging from concept, to production, to delivery. 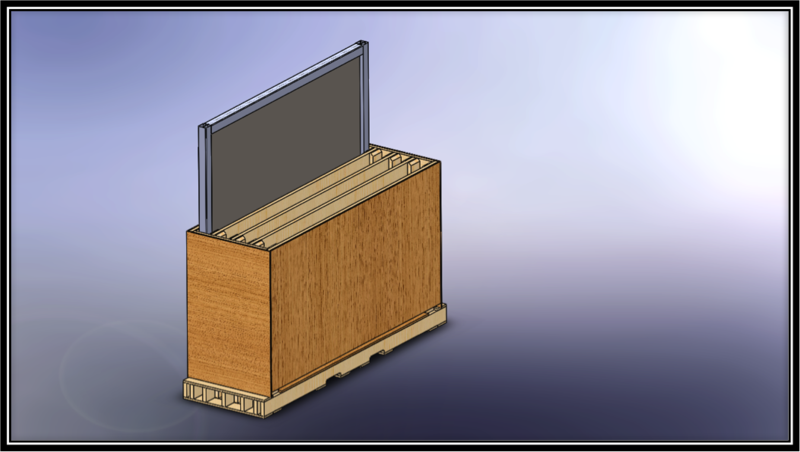 The SOLIDWORKS program has given us the unique ability to work with our customers to design — from concept to delivery — a custom-built crate or pallet that fits the desired application perfectly. We often start with a new product, or an obstacle to efficiently shipping an existing product. We discuss all possibilities and ideas while brainstorming during our initial analysis meeting. Our packaging engineer then creates the model for review and modification with input regarding strength, cost, appearance, ease of use, and capabilities. Once the 3D model is approved, we create drawings with all the measurements and specifications detailed for the final approval and production of the first prototype. At this stage, we have a list of all components and specified wood species with exact dimensions. In the past, these steps were completed by hand drawing a design, and estimating the materials needed to complete production. Now our “start to finish” SOLIDWORKS design process is more efficient and precise, benefiting both our customers and our production personnel. Once our production team builds a prototype from the drawings, we field test the design and get final approval for regular full-production orders from the customer. We keep the drawings on file for reference during each repeat order. The customer can request a copy of the drawings for internal quality purposes if desired. This design capability creates a competitive advantage in the industry with our customer base. It improves our quality controls thus decreasing costs through waste and scrap reductions.